Many of you have seen this cartoon circulating around the Internet. Somebody took my cartoon "Going...Going...Gone!," stripped off my caption and my name and altered it. This is in complete violation of copyright law and respect for an artist's work. In the spirit of new beginnings, I won't call whoever did this any names or what they might do with themselves. Use your imagination. This appeared on the Southern Poverty Law Center website. If they are lawyers, they're not very good ones. They certainly don't know, or care, about copyright law. The next day, the Southern Poverty Law Center apologized. They even said "We screwed up." On Friday, we posted a cartoon that seemed to perfectly encapsulate a tremendously emotional week. Five panels depicting the Confederate battle flag going down a flag pole, representing the political conversation following the horrific events in Charleston, South Carolina, and a rainbow (LGBT pride) flag going up in its place, representing the Supreme Court’s decision to make marriage equality the law of the land. And did it resonate. At this moment, the post has nearly 260,000 Likes and over 190,000 shares. The problem? Well, we got the credit wrong. 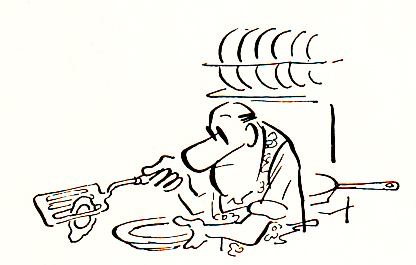 And the cartoon was modified from its original form. 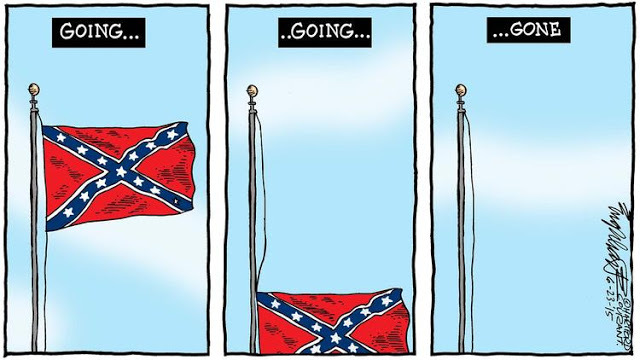 On Sunday we learned that the first three panels of the Confederate flag going down was the work of Hartford Courant editorial cartoonist Bob Englehart, who originally posted it on June 22nd (see here: http://sp.lc/OXaHP). 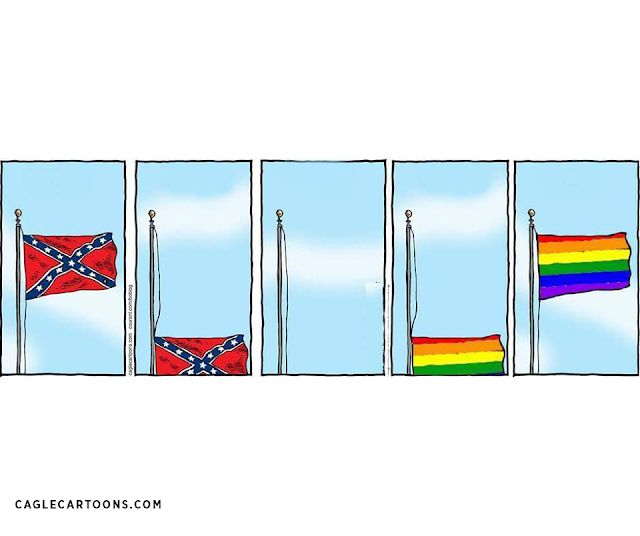 Someone had added the last two panels of the rainbow flag being raised. In doing so, they removed the original caption “Going…going…gone” and, even worse, deleted Mr. Engelhart’s signature, which also included the date and the Hartford Courant copyright. We screwed up. We found the image on Twitter and credited the editorial cartoon syndicate Cagle Cartoons, which appeared in the doctored cartoon. Thankfully for us, an editor at the Hartford Courant generously asked that we only correct the record here, which we were eager to do. In sum: We apologize to Mr. Englehart and his colleagues at the Hartford Courant. 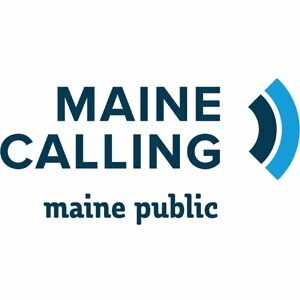 Everyone here who liked that post should go over and check out his work. If that cartoon resonated, you’ll be pleased to know Mr. Englehart publishes multiple times a week. 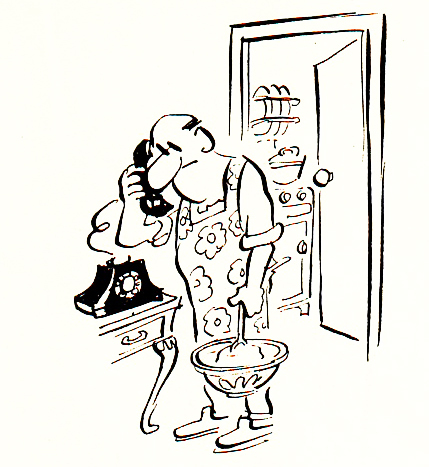 MAN IN APRON AND OTHERS by Larry, "one of Punch's most popular cartoonists." This was his first collection. It's copyright 1957, 1958, 1959 Bradbury, Agnew and Co. Ltd. Here are just a few of his cartoons. They are all wordless and there's some wonderful writing here. On some them, I had to really look before I "got" the cartoon. Love his breezy style. 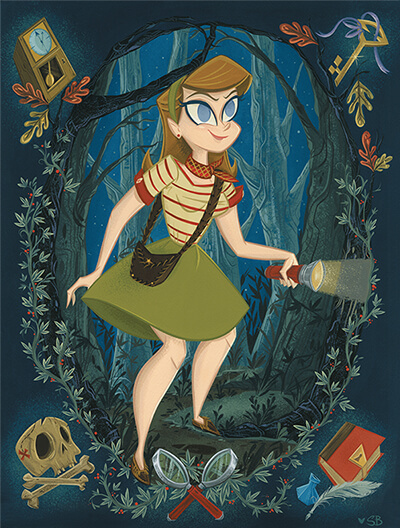 Above: a new Papercutz 10th anniversary Nancy Drew print celebrating Papercutz by Stephanie Buscema. Hard to believe it, but ten years ago, graphic novels for young adults were hard to find. Papercutz was founded by Jim Salicrup and Terry Nantier to fill that void. This is their 10th anniversary year, and to celebrate, they will be selling this prints related to their line of books. This limited edition print of Nancy Drew was available at Bookcon. More will follow. 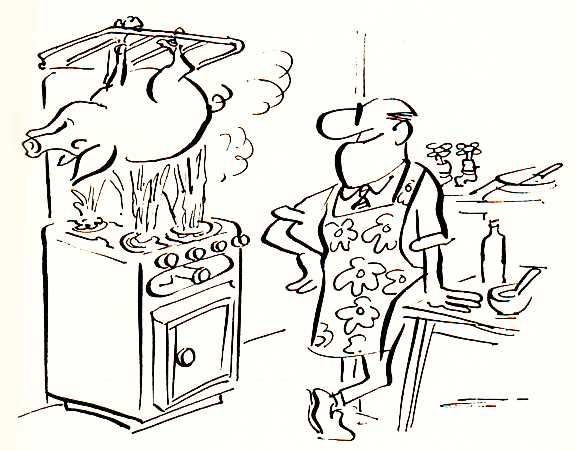 Helen Parsons new blog is a rare, behind the scenes look at the process of writing gags that sell. Helene Parsons is a working gag writer for syndicated and magazine cartoonists -- as well as comedians and broadcasters. And she has started her own blog, Cartoon Gagwriting: My Experience. I don't use gag writers myself, but some cartoonists do. By outsourcing the writing, it allows them to concentrate on drawing and producing material. From reading books about joke or gag writing, I learned that they almost always had a set up and a punch. The set up is the straight, or factual part. The punch is the unexpected part and should come at the end. I also learned that certain words were funnier, specifically, words that had the "k" sound in them. Also, that there was something called a series of three, where the first two items were the set up and the third item was the punch at the end. After looking at thousands of cartoons in publications such as The New Yorker, Barron's and Reader's Digest, I could see that fewer words had a greater punch. I became familiar with the situations these cartoons focused on. 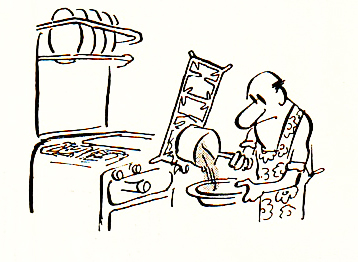 For example, cartoons in Barron's mostly focus on the business world. I felt I could write business gags because after working in offices for many years I had opinions about things. I could see the humor in the relationships between bosses and workers, workers and co-workers, salary issues, lazy workers, lazy bosses. You get the picture. I also realized that I liked to write about restaurants (snooty waiters, demanding customers, lousy food) and relationships (husband and wife gags, mostly). 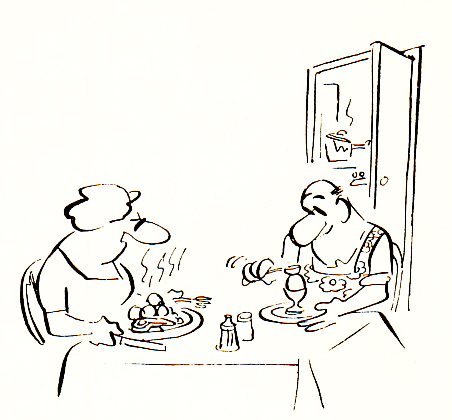 Go read Helene Parsons' Cartoon Gagwriting blog. New Zealand cartoonist Tom Scott explains what freedom of expression means to him for TEDxAuckland. It runs 16 minutes. 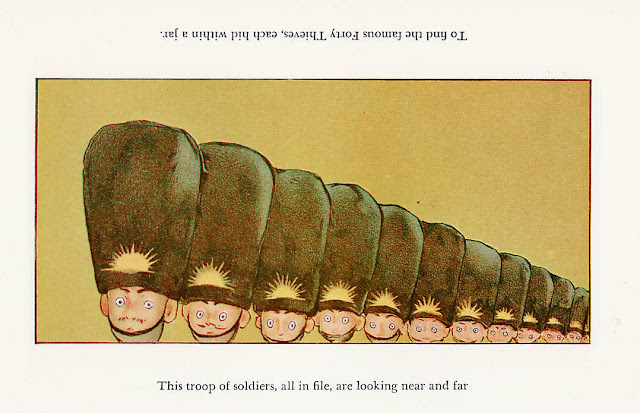 TOPSYS AND TURVYS by Peter Newell (1862-1924) was originally published over a hundred years ago. 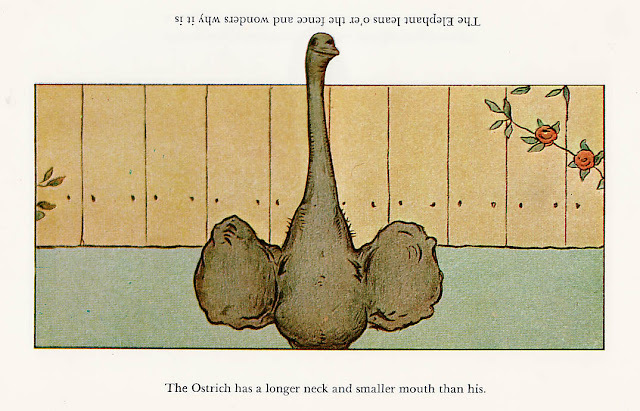 It's the same with all of Peter Newell's work: all published over 100 years ago, and all of his six "novelty books" (such as THE SLANT BOOK, THE HOLE BOOK) are still in print. Newell also wrote and drew a newspaper comic strip titled THE NAPS OF POLLY SLEEPYHEAD (1906-07). There were, at the beginning of the 20th century, a slew of fantasy strips -- of which only LITTLE NEMO is remembered today. Above is the cover of the Dover edition ("designed for years of use!") and it includes selections from TOPSYS AND TURVYS (1893) and TOPSYS AND TURVYS - NUMBER 2 (1894). No copyright information at all in here. 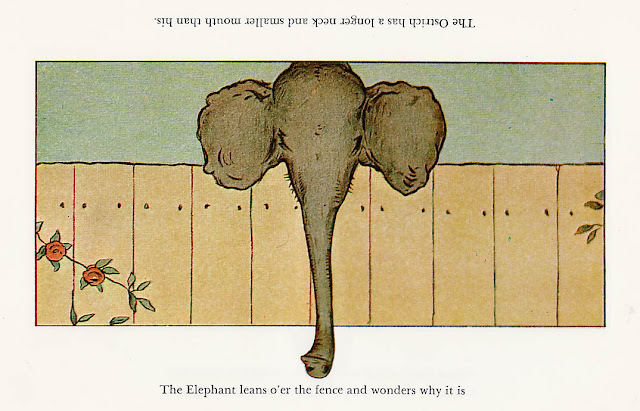 "The Elephant leans o'er the fence and wonders why it is"
"The Ostrich has a longer neck and smaller mouth than his." And that's the gimmick: you see a different picture, with a rhyming conclusion. 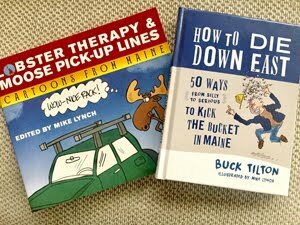 Note: other blogs would just snidely tell you to turn you monitor/iPad/whatever upside down, but here at Mike Lynch Cartoons, we're all about customer service. Below is the same picture, upside down. No need to strain, gentle blog reader! Thank you and have a nice day. 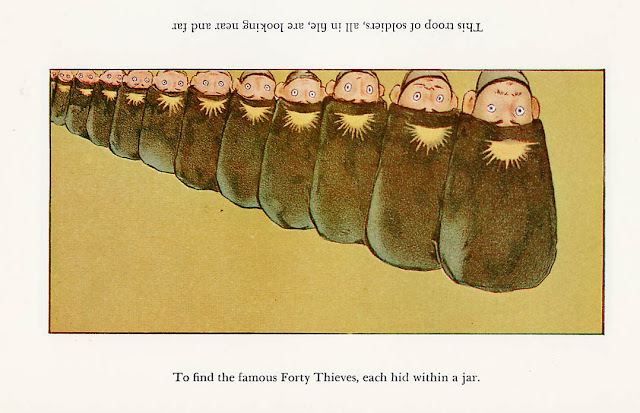 "This troop of soldiers, all in a file, are looking near and far"
"To find the famous Forty Thieves, each hid within a jar." Most of the time, I look at that first picture and can't figure out what the upside down version will be and how it relates. Some wonderful work. 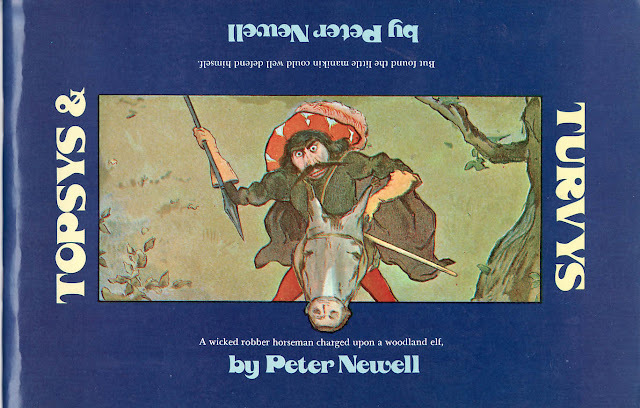 "Peter Newell liked to say that he and the Civil War both broke out in this country at the same time. He was born near Rice's Corners, McDonough County, Illinois, on March 5, 1862, the fourth child of George Frederick Newell, an Ohioan, and Louisa Dodge of Chautauqua County, New York. His childhood years were spent in Bushnell, a small town in west-central Illinois." 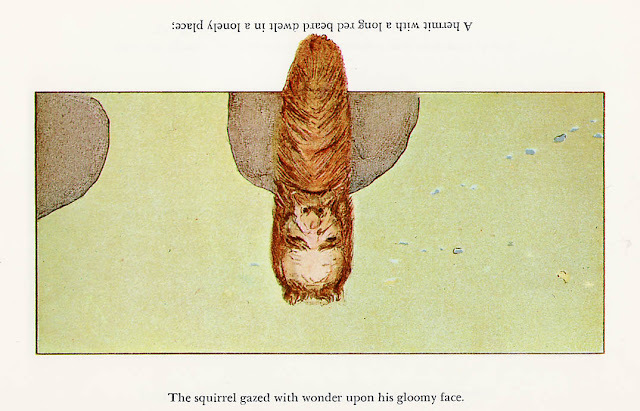 "A hermit with a long red beard dwelt in a lonely place"
"The squirrel gazed with wonder upon his gloomy face." "By the spring of 1883 he had moved east to New York, where he enrolled in classes at the Art Students' League while hoping to find steady employment as an illustrator for periodicals. 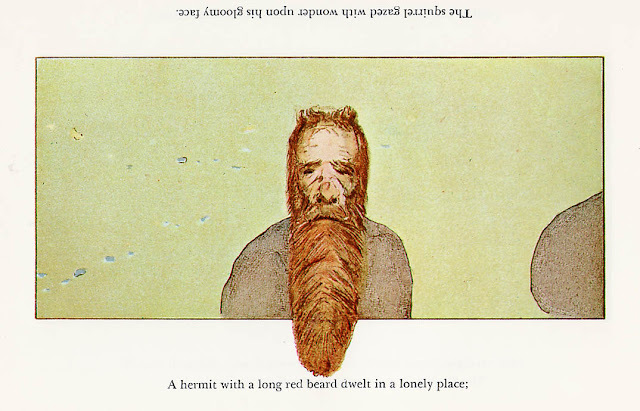 His work had been published in the New York Graphic and Harper's Bazaar by the fall of 1883; the appearance of his simple line drawn comics was the beginning of a career in humor that would make Peter Newell one of the more prolific and best-known illustrators of his day." 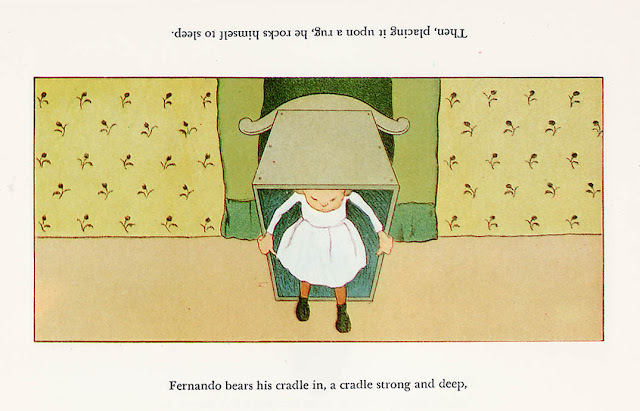 "Fernando bears his cradle in, a cradle strong and deep"
"By 1893 the development of halftone reproduction had made possible the style of illustration for which Newell is best remembered, the continuous tone drawing. 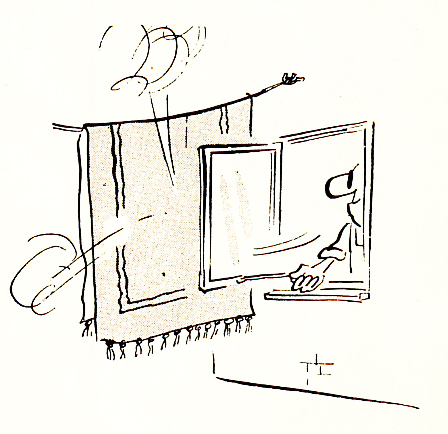 His single-frame comics underscored with short, whimsical rhymes began appearing in Harper's Monthly and other magazines at this time. He was catapulted to fame by one in particular, "Wild Flowers," which appeared in the August 1893 issue of Harper's Monthly; several of these comics were compiled in one volume as Peter Newell's Pictures and Rhymes, published by Harper in 1900. Soon nearly every issue of most of the Harper magazines, as well as some Cosmopolitan, Metropolitan, McClure's and Collier's, carried a Newell comic or a Newell-illustrated story by authors such as John Kendrick Bangs, Stephen Crane, Philip Curtiss, Burges Johnson, Frank Stockton and Mark Twain." Ahh! Those were the days! 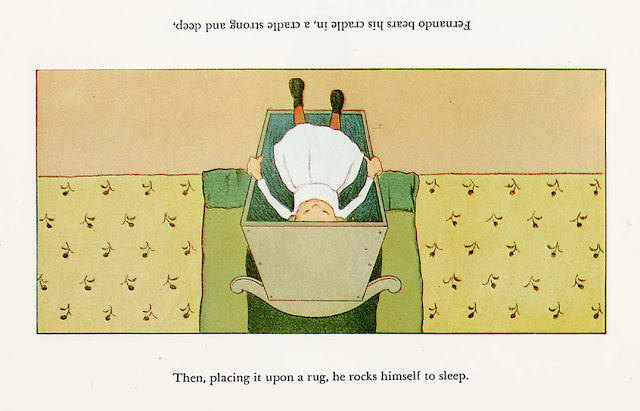 "Then, placing it upon a rug, he rocks himself to sleep." In 1894, the successful illustrator Newell and his family moved to Leonia, NJ. "Over the next twenty years Leonia grew to become an illustrators' colony much like the one centered around the Pyle-Wyeth group near Wilmington, Delaware. The lively community of artists formed clubs, theatrical and lecture societies, and held exhibitions, costume parties and pageants. The Leonia School of Illustration was opened there by artists Harvey Dunn and Charles Chapman. The Newell family participated in all aspects of the intellectual, musical, religious and social life of the community. Peter Newell was a founding member of the Men's Neighborhood Club of Leonia and served on the village's first Board of Health. 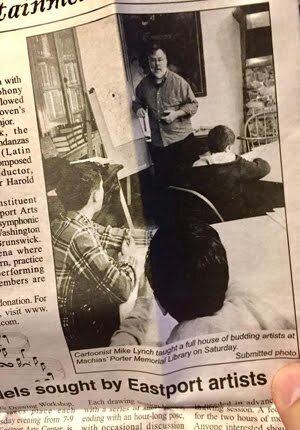 He played the cello, though apparently not well, and was a popular toastmaster and lecturer known for his "chalk talks" and other impromptu presentations. Both of the Newell daughters married illustrators, and Howard and Josephine Newell McCormick became leading members of the second generation of artists to live and work in Leonia." The house wasn't just any house. It was featured in an article in Scientific American and a picture postcards as well! 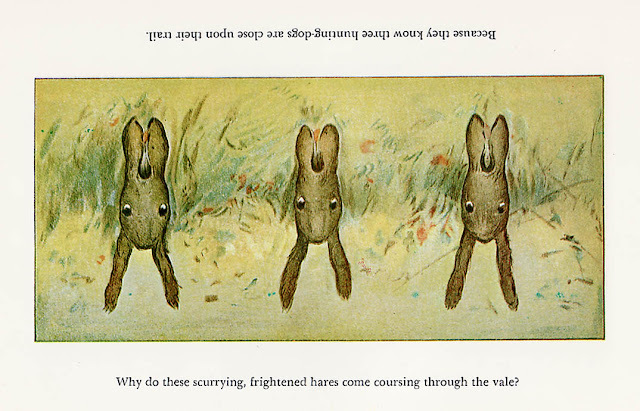 "Why do these scurrying, frightened hares come coursing through the vale?" 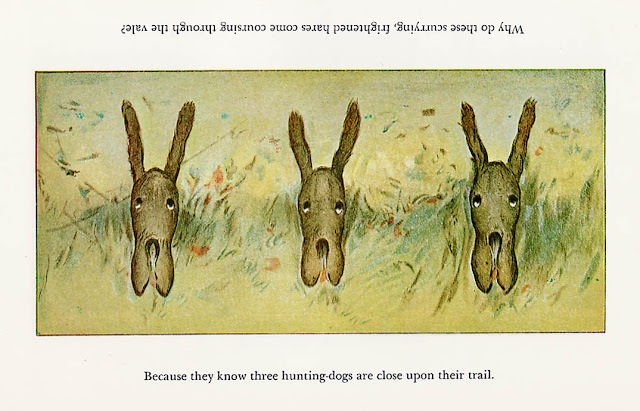 "Because they know three hunting dogs are close upon their trail." He traveled quite a bit. Like a lot of artists of the time, there were "sketching trips" to Europe. He was deeply grieved upon his only son's death in The Great War. In 1923, the Newells moved to Little Neck in Queens, NY. "By the end of that year Peter Newell had become physically crippled by amyotrophic lateral sclerosis and was unable to work; he died in his home on January 15, 1924, at the age of 61." Related: Cartoonist Gustave Verbeek also tread the same ground with his latter comic strip THE UPSIDE DOWNS in which he drew a six panel Sunday page which your would read all the way through and then turn it 180 degrees to read the conclusion. -- Edited from an original blog entry dated May 9. 2008. BETTY AND VERONICA SPECTACULAR #138, June 1966 "Pay Dates Incorporated"
1966 was a great year! So much pop culture! The Beach Boys' "Pet Sounds" and the Beatles' "Revolver" albums debuted, as did TV shows like STAR TREK and BATMAN. In the midst of all this, some teenagers were selling strongly on the comic book rack. I'm talking about Archie's gang; specifically BETTY AND VERONICA SPECTACULAR #138, June 1966 (which is copyright Archie Publications). This was a more innocent time and a story like "Pay Dates Incorporated" (see below) simply did not resonate the way that it does today. Oddly enough, it all starts with a typical teen problem in these Archie books: how do I get some money to buy some cool stuff? I was fortunate enough to hear the story of Archie from Joe Edwards himself. Joe was there, in the MLJ offices, with Bob Montana and John Goldwater, as they were hashing out ideas. Publisher Goldwater (whose first name was the "J" part of the "MLJ" publishing acronym) wanted a new comic book story, maybe something like the Andy Hardy series of movies. But what would it be? What do teenagers want? How do you appeal to them? He turned to the then-twenty year old Joseph Edwards. "Joe, you're a young guy. What do you want?" asked Goldwater. "Three things," said Joe, counting on his fingers. "Girls, of course -- money, so I can take girls out -- and a job, so I can make the money to take out the girls." Bob Montana created the initial look of Archie Andrews, Jughead and Betty Cooper for Pep Comics #22, December 1941. By the next year, Archie had his own title. Okay, so let's go 25 years in the future -- back to BETTY AND VERONICA SPECTACULAR #138. How do the girls make money? The answer is peddling flesh. Yes. Really. In an Archie book. But, hey, it was approved by the Comics Code Authority, so it's alright. The art is by the incomparable Harry Lucey. 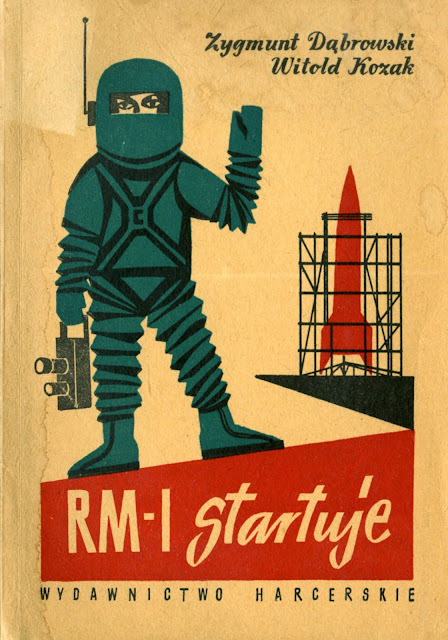 The Dreams of Space blog has found a book in Polish. The cover graphic for RM-1 STARTUJE is above. Isn't great? The book seems like a primer for kids about science and space. Please take a look. If you can translate, Dreams of Space would welcome you!
" … Parade is densely packed with super seventies-ness: a must read for any 70sphile. Enjoy!" And it is. Do take a look. 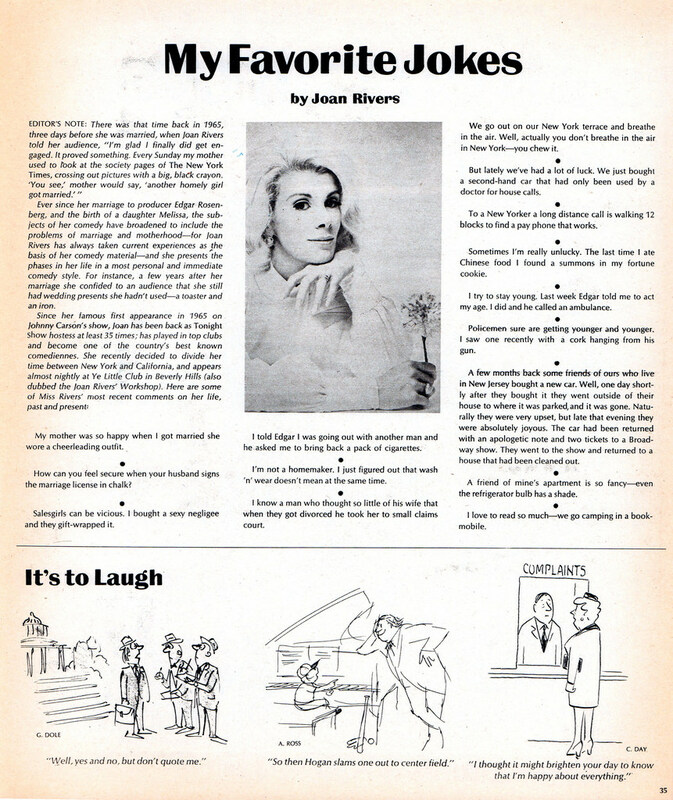 And there are also three cartoons (by George Dole, Al Ross and Chon Day) on the page with Joan Rivers jokes. ("I try to stay young. Last week Edgar told me to act my age. I did and he called an ambulance.") I nicked the page above. This 1982 TAKE A LETTER YOURSELF! book was written as a tongue in cheek guide for female secretaries to deal turn the tables on the white males in power. 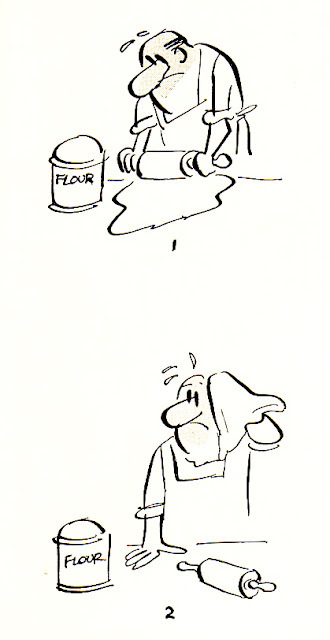 It was written by Kathy Matthews and illustrated by the great cartoonist Frank Modell. It's copyright both of them, and was published by Ballantine. The energy in Mr. Modell's line is what captivated me to buy this book from a second-hand dealer in Bristol, NH. Actually, the book was in a large shelf on the second floor of a barn. What I like is that you can see the speed in which Modell is drawing. Sometimes the ink can't catch up! And sometimes you can see some of the light pencil construction lines in the wash drawings. This is what great cartooning looks like: vital, energetic and fun. These are just a few of the drawings from the book. 1971 DATE WITH DEBBI: "Take It Off!"